I've been asked a few times how to get Disneyland tickets for cheap. The answer: It's darn near impossible. Nonetheless, here is what I've learned about buying tickets, volunteering for complimentary tickets, & saving at the Disneyland Resort and any special ticket offers currently available. 1. If you can't find a discount price, buy Disney gift cards covering the cost of admission at Ralphs or Vons. At the very least you will get points to use to save on gasoline at Shell or Chevron stations. When you get to Disneyland exchange the Disney gift cards for tickets or annual passes at the ticket booth. I also heard that gift cards bought using a Red Card at Target are discounted 5%. Check it out for yourself and save $5 for every $100 worth of Disney gift cards. Even if you plan to purchase an annual pass with the monthly payment option, you will still have to make a down payment of $96 per person, buy enough gift cards to cover the down payment. 2. If you find the ultra-rare deal for a half-day ticket, such as $54 admission after 4pm, find out how many hours Disneyland is open on that day and find the hourly price. If the park is open 'til midnight you'll have 8 hours at the park, costing you $6.75 per hour. If you were to pay full price for the same day, and it's open for 16 hours, it will cost you $6.00 per hour. You have to decide which is better for you, be sure to take into account cost of meals and parking. Find Disneyland Resort hours here. 2013 Disneyland Resort Annual Passes at Ralphs. 3. If you time it right you might be able to get last year's annual passes, but use them this year. Nearly every spring, in early June, the Disneyland Resort increases ticket prices. If you plan to visit Disneyland later this year, and have the money available, you can buy the tickets or passes at the grocery store at the old prices even though the ticket prices have increased at the ticket booth. The old price ticket cards may be available in the grocery store for a few weeks before they are swapped out for cards with the updated price and can redeemed anytime until the expiration on the card, generally the end of the calendar year. Read how I did just that in 2013. 4. Some agencies offer discounted tickets. AAA members and L.A. County employees have access to slightly discounted tickets, but they must be purchased through the agency offering them. Selected multi-day passes purchased through AAA include free parking. 5. Before you buy annual passes take into account the amount of gas it takes to get to Disneyland from your home. My car gets about 18 miles per gallon. Disneyland is 20 miles from Montebello. For me that's over 2 gallons round trip. At today's prices, that equals about $6 in gas per Disney visit. 6. Calling Disneyland ticket information and begging doesn't help. I've tried. The only offer available was for Annual Pass holders to save $20 if they renew before the expiration of their old ticket. Step 1: Fill bottle. Step 2: Question cloudiness. Step 3: Wait for water to clear & drink! Free ice cold water from Cast Members at counter restaurants! 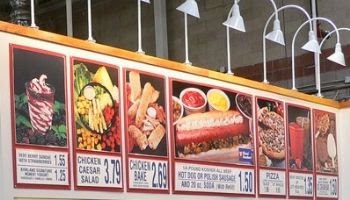 If you forget to pack food and live near the 5 Freeway, stop by Costco in Commerce off the Washington exit. Load up on food on your way to or from the park. Costco's awesome churros are $1.10 compared to Disney's $4! Hot dog & soda combos are only $1.50. The food court is open until 6pm. Closed Sundays. Costco membership is not necessary, the food court is accessible from outside of the building. Make a pit stop at Costco to fill up before or after a trip to Disney. 2. Buy your souvenirs before you go. Most large mass retailors have Disney themed merchandise, or prices at the Disney Store are less expensive than prices in the park. Pick up matching Disney themed shirts from a local store, or secretly buy Disney themed toys, autograph books, or stuffed animals before visiting the Resort and pull them out as a surprise for your children when they get there. 2. The first day of any annual pass you buy, even if it's a block-out day, you are allowed admission to the Disneyland Resort. For example, If you are buying the Southern California Select which only allows weekday visits, your first day, even if it's Christmas day, or a Saturday, you are allowed admission to the parks. 3. When you visit Disneyland Resort for the first time, if buying the Premium Annual Pass, take your parking receipt with you to the ticket booth; the parking fee will either be refunded or credited to your balance. 1. When in line for a ride and the line splits, which side do you go on? The right or the left? Save a few minutes in line by following Disneyland Inside Out's tips here. 2. Arrive at the gates with ticket in hand 40 minutes before the park opens. Disneyland and California Adventure allow guests into the park 30 minutes before the opening. You'll get a head start and be closer to the rides when the park does open. My family once enjoyed 9 rides in the first hour and half of the park opening! Warning: Both Disneyland & California Adventure have "Extra Magic Hour & Magical Mornings" a few times a week where Guests with multiple day passes are allowed admission to the park one hour early. On those days it won't matter how early you get to the resort, there will already be lines. Check here for early admission days and avoid them if you plan to arrive early. My last tip: If a trip to Disneyland is a financial stretch for your family consider starting a "Disney Fund." Have a piggy bank especially to save for Disney. Kids can contribute coins found on the floor and birthday money. Every night put all your spare change, rebate checks, money saved with coupons, and money found in the washer; it all goes to the Disney Fund! My family spent the better part of 2 years saving. With all of us contributing, even the baby, we saved enough for annual passes. Okay, one more tip: If all else fails, apply for a job at the Disneyland Resort. After a grace period employees can bring in three guests for free several times a year. Click here for more information. Great tips here, will share! Great, But You can get Measles or Chicken pox, right now !!!! LOL! Or get the damn Measles vaccine.